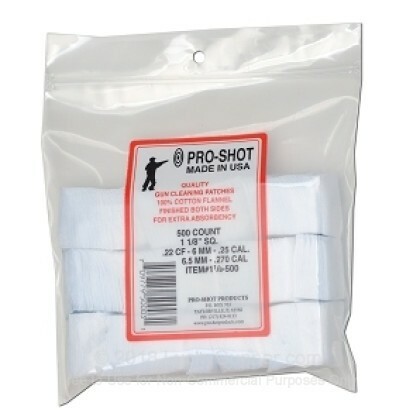 Pro-Shot cleaning patches are made of high thread count American cotton flannel that excels at absorbing solvents and eliminating fouling and residue without abrading rifling or other metal surfaces. This particular pack contains 500 square patches, each of which measures 1 1/8" a side. These are particularly well suited for cleaning barrels in the .223 to .270 caliber range. A cheap, effective way to keep your weapons clean and ensure higher durability and performance.